HLOS brings a taste of the French Riviera to Halifax! Join us for our biggest social event this year! 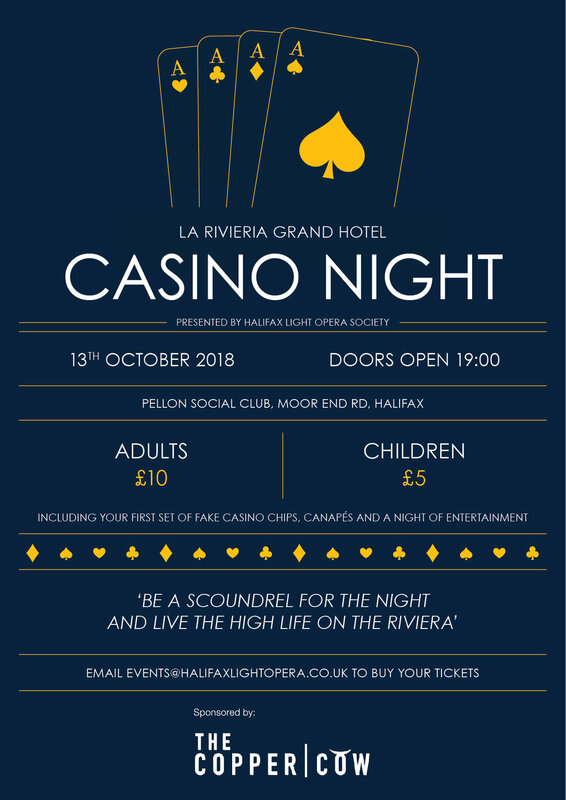 We have professional croupiers hosting black jack and roulette plus entertainment and French-themed canapés as we begin the countdown to our next production: Dirty Rotten Scoundrels! THIS IS A FAMILY EVENT - children are more than welcome and can join in the fun as all bets use fake money! Tickets for children are £5, adults £10 - including our casino's currency for your first bets! There will be prizes for those who come out on top! DRESS TO IMPRESS - you may wish to get out your lucky dickie-bow or simply dazzle in your favourite cocktail dress! The dress code is not black tie but we feel we should get dressed up for the occasion - it's all about living the high life! TICKETS are now available at rehearsal or you can email events@halifaxlightopera.co.uk to reserve yours now!